Following the Solar Plan, the NDRC further published the Renewable Power Development Plan, also under China's national 13th Five Year Plan. The plan covers hydro, wind, solar, biomass, geothermal and tidal energy. The plan states that by 2020 and 2030, Non-fossil primary energy consumption rate is expected to be 15% and 20%. By the end of 2015, 320 GW of hydropower, 129 GW of grid-connected wind, and 43 GW of PV installed capacity had been installed. 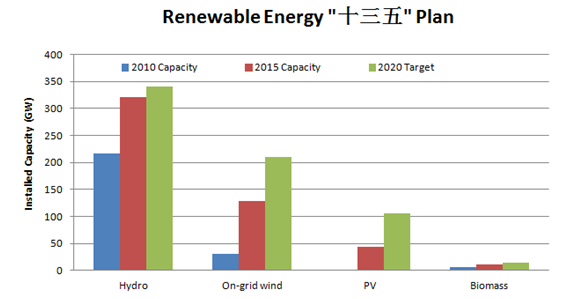 Wind power generation on-grid price is on track to being competitive with local thermal power by 2020, while PV on-grid price can equal power grid selling price. The NDRC recently issued benchmark price adjustments for utility solar and onshore wind, revising them downwards, though not as much as many PV producers feared after the October draft was released for soliciting opinions. Beginning January 1st, 2017, Solar on-grid price will be reduced to 0.65, 0.75 and 0.85 RMB/kWh, while distributed solar benchmarks will not change. Begin from January 1st , 2018, Onshore wind on-grid price will be reduced to 0.40, 0.45, 0.49, 0.57 Rmb/kWh, while Offshore wind projects on-grid price will not change. While the reduction in prices is not as drastic as first indicated in the draft release, the reduction in prices in an already crowded PV field will likely lead to consolidation as China's domestic PV market matures. However this tariff reduction should help provincial subsidy schemes fill their deficits, as recently reports of delayed subsidy payouts to registered PV and Wind plants suggest at a large subsidy shortfall across many provinces. While offshore wind occupies only a small percentage of China's total wind generation capacity, we expect it to grow steadily over the coming years. Decentralizing project approval authority to provincial authorities is a positive step towards accelerating offshore wind project approvals and should help China meet it's offshore wind target of 5 GW. While short on specifics, the overall policy document reinforces the overall trend of market reform and also crucially calls for introducing spot markets, widely seen as a key step to liberalizing China's power sector. Retail companies must have at least 20 million RMB in assets to participate in the retail market. Retail companies with assets valued between 20 million and 100 million are limited to selling between 600 GWh and 3 TWh per year. Companies with assets between 100 million to 200 million RMB are limited to selling between 3 and 6 TWh per year. Retail companies with over 200 million RMB in assets have no limit to their yearly sales. Furthermore, the market will be slowly opened over the next three years. The first phase of the retail market from 2016-2017 will be only open to key provincial industrial users with a yearly electricity consumption of over 8 GWh, other industrial users with consumption over 80 GWh, and commercial enterprises with yearly electrical consumption of over 50 GWh. The second phase (2017-2018) will open the market for commercial and industrial users rated at 110kV and 35 kV. The third phase, from 2019-2020, will open the market to commercial and industrial users rated at 10 kV, while the final phase in 2020 will see the market completely open to other standard users. While Guangdong's direct trading center has been in operation since July 2016, this has been limited to only direct power trading between large industrial users and power producers. While cautious, Guangdong's retail reform is another positive step for liberalizing China's electricity sector. Note: Our Cleantech News Update for October 27th, 2016 wrongly reported on a draft of the NEA's “soliciting opinions” on Solar and Onshore Wind tariff adjustments as having been actually implemented. We apologize for the mistake.